It takes us a team of over 100 volunteers to pull this off! Plus a team of about 10 committee members and "leads" to organize it all. Please don't hesitate and sign up to help. Can we bake 100 cakes again?! Last year, 100 happy winners walked away with a cake from our amazing cake walk! What on earth is a Jolly Jar?! Not a lot of time but want to help? Why not donate an item to the raffle, or would you like to sponsor an item at the carnival to help cover our outgoing costs? (advertising and tax receipt available!). If so, contact us! Jolly Jars are creatively decorated jars filled with a variety of fun items for children that are sold at our Carnival for $3 each. It's a great way be creative with your kids, and have fun donating to your school PAC. Sorry no pre-used items in jars permitted. 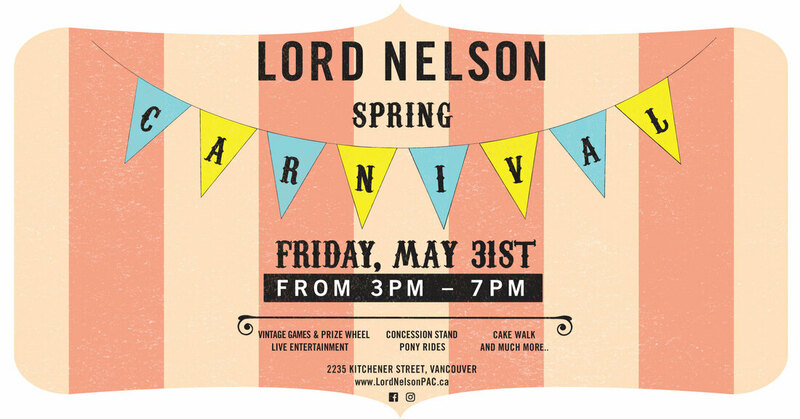 Join in the fun at our 6th annual Spring Carnival fundraiser! Fun for kids - young and old - there will be something for everyone to relish! Come out and support Lord Nelson Elementary School. Located at 2235 Kitchener Street. Your kids will be coming home soon with raffle tickets for sale. Please support them to try to sell their tickets. Top sales for classrooms win a pizza party (K-1, 2-3,4-5, 6-7), plus grand prize for the top sales in the school.